Contractors work on removing the bridge supports, Wednesday, now that the entire deck of the Rt. 926 bridge has been removed. The new bridge is expected to be open on or about Sept. 1. 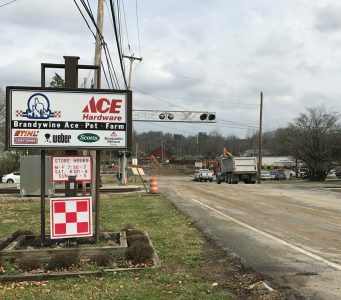 POCOPSON – “Well, the bridge is out!” exclaimed Pocopson supervisor Elaine DiMonte as soon as the public comment portion of Monday’s night township meeting was concluded. The much-anticipated closure of the bridge at the intersection of Route 52 (Lenape Road) and Pocopson Road occurred as planned on Feb. 13 and remains a standing agenda item for the duration of the closure over the next six months. The $8.6 million project to replace the 1937 bridge (rehabbed in 1974) is expected to be accelerated and completed by Sept. 1, by Clearwater Construction, Inc. The contractors are doing eight hour shifts on the weekdays and ten hour shifts on Saturdays. “We are very impressed with the general contractor…they absolutely know what they are doing,” said DiMonte. A permanent traffic signal at the intersection is up and running. According to DiMonte, a few general complaints were received about the new signal. She mentioned adjustments will be made to the timing of the lights as deemed necessary. The new signal is the first of its kind in the Philadelphia region and includes a flashing yellow arrow for left turns onto Pocopson Road and West Creek Road. At last month’s meeting, the board approved the hiring of Birmingham Police to be a presence at the intersection for the first three days. A resident raised concerns over the township footing the $750 bill at the taxpayers’ expense. DiMonte stated that PennDOT and the contractor absorbed the cost. The supervisors informed the residents that the detour on Creek Road will begin in June and this would help alleviate the congestion at the stop signs on the Route 52 bridge. For up-to-date information on the bridge closure, please reference Transportation Management Association of Chester County’s website at www.pa926.com. On the topic of traffic concerns, the supervisors addressed a resident’s concerns regarding the development proposal for Crebilly Farm located in Westown Township on Routes 202 and 926. Previously, the supervisors approved the acceptance of a resolution to support Westtown township in its efforts to preserve the 322 acres of the scenic and historic Crebilly Farm. The land, part of the Battle of the Brandywine during the Revolutionary War, created its own battle between Toll Brothers and the Westtown residents in opposition. The plan to develop the land with 319 residential lots would increase the township’s population by about ten percent – and increase traffic. The supervisors urged residents to create petitions to show support and to attend the Conditional Use Hearing. The hearing is scheduled for March 29 at 6 p.m. at Rustin High School. The supervisors approved East Bradford Township’s request to support the restoration of the historical Strode’s Mill, located in the Strode’s historic district, including 120 acres and 11 buildings. Plans include restoration of the nationally known 1875 barn that at one time was a pork-processing barn for sausage and scrapple. Plans also include a walk and bike pathway to connect West Chester borough with trail heads educating the public about the historical sites.